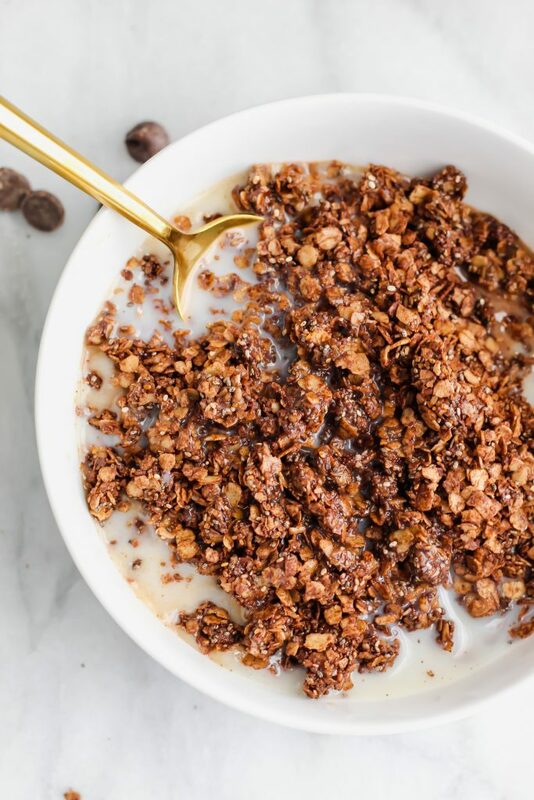 This Chocolate Coffee granola is full of healthy ingredients like rolled oats, crunchy fibrous chia seeds, cocoa powder and of course – espresso powder! It’s healthy and delicious with a superb coffee kick! 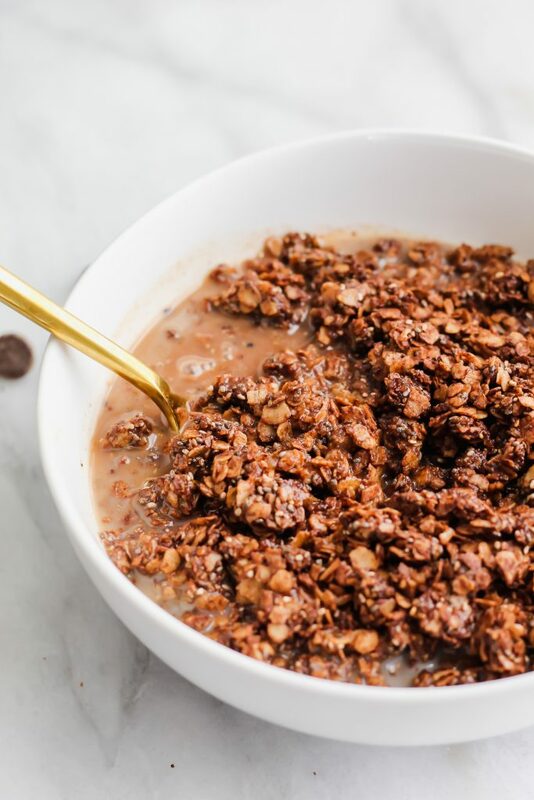 Enter in – Chocolate Coffee Granola! 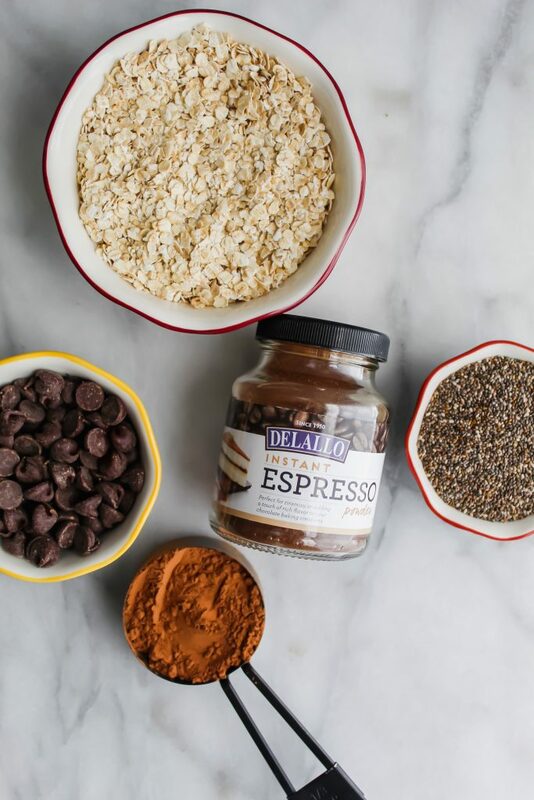 Not only does this have only 8 easy pantry ingredients – it won’t send you into a sugar coma and it DEFINITELY won’t make you fall asleep; HELLO espresso powder!!! Best part?! 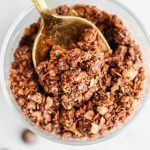 I kid you not, the first time I tasted this Chocolate Coffee Granola I told my husband “This tastes like an adult version of Cocoa Pebbles.” It’s so extra chocolatey, crunchy, delicious and just the perfect snack or breakfast to munch on! I love how the coffee flavor isn’t super overwhelming. I used Delallo Espresso Powder which I highly recommend! It’s ground SUPER finely so you don’t ever get like, weird coffee stuff in your teeth like you would if you just ground up normal coffee. With the espresso powder, it’s just enough to make you think “Oh wow, this is like a delicious latte.” But not like “Oh wow, this is a bitter Americano with no cream or anything good in life at all.” Can you tell I’m not a black coffee drinker? 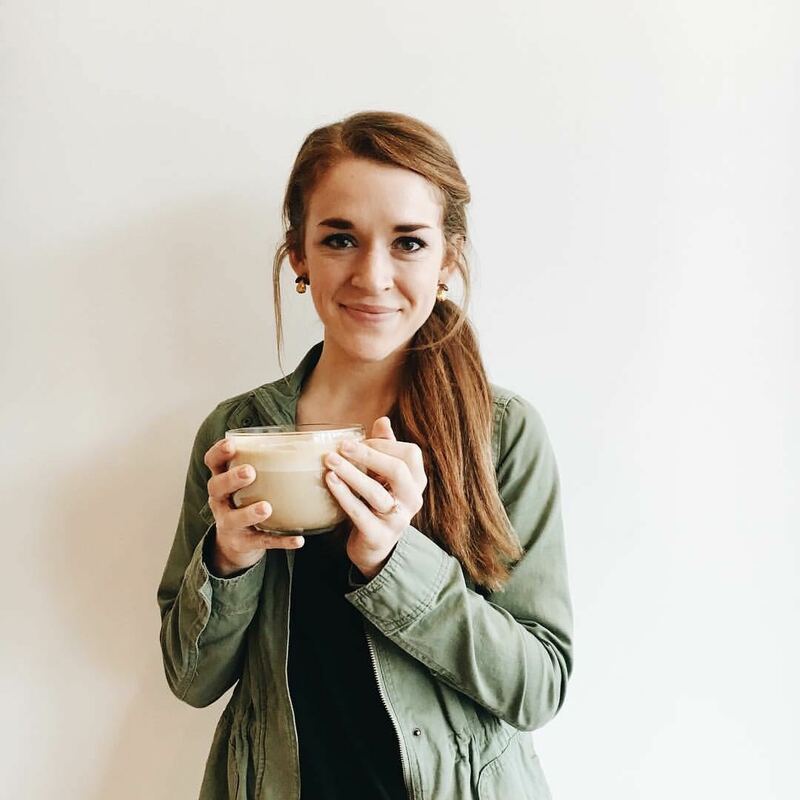 Heavy cream or bust! What else is in this Chocolate Coffee Granola? The chia seeds add SUCH a delightful crunch. Not to mention, tons of protein and fiber. The amount of chia seeds in this granola yields 8 grams of added protein and 22 grams of fiber! The deep chocolate flavor of this granola comes from the unsweetened cocoa powder added. 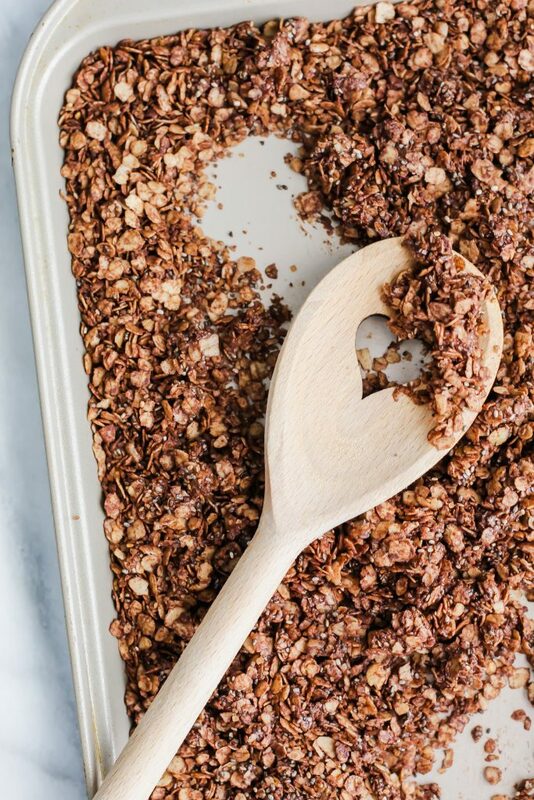 You add the chocolate chips at the end of the baking process and gently fold them into the granola – making them SUPER DUPER MELTY AND DELICIOUS. Oh yes. However, even though there is chocolate present, I love how this granola isn’t overly sweet. 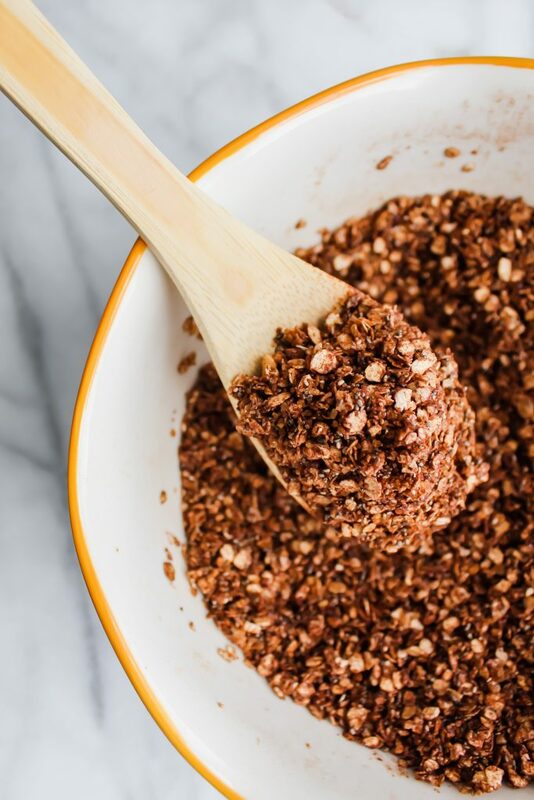 Yes, there is added “refined” sugar (I used turbinado for an even crunchier granola), but you can definitely substitute it for coconut sugar, honey or maple syrup. This is perfect for meal prep! Bake a big sheet pan of this on a Sunday afternoon and not only will your house smell amazing, your breakfast/snacks will be done for the ENTIRE WEEK. Yup! Let’s get into how to make it! First, as always, preheat your oven to 300. Here is the super easy part! You basically add EVERYTHING into one big ol’ bowl. I mixed together the oats, vanilla extract, turbinado sugar, cocoa powder, chia seeds and the espresso powder together to combine them. Then, I added the melted coconut oil and mixed everything until it was all “sticky” and coated. Finally, pour it in a bowl and eat it up! Or eat it by the handful. Or spoonful. No matter how you consume it, consume it! So yeah. Pretty dang simple recipe but MAN is it delicious and for me, a nice break from savory in my breakfast routine. Hope y’all enjoy it!! 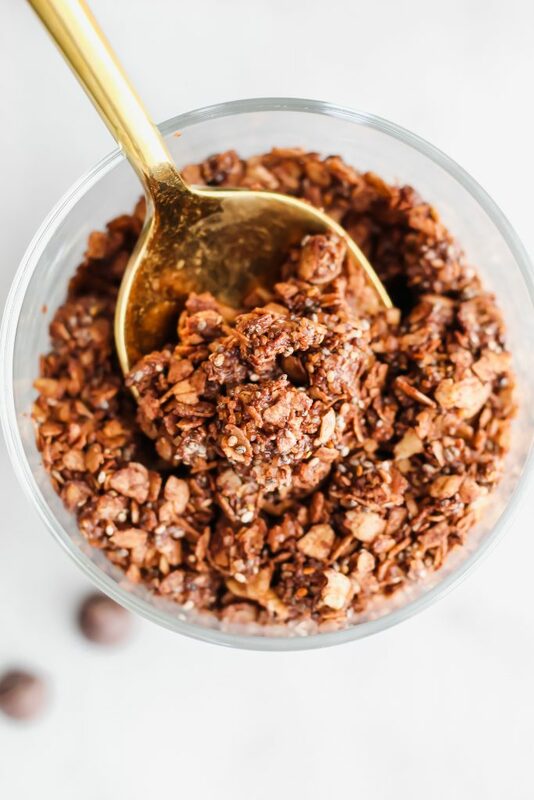 This Chocolate Coffee granola is full of healthy ingredients like rolled oats, crunchy fibrous chia seeds, cocoa powder and of course - espresso powder! It’s healthy and delicious with a superb coffee kick! Preheat your oven to 300 degrees. 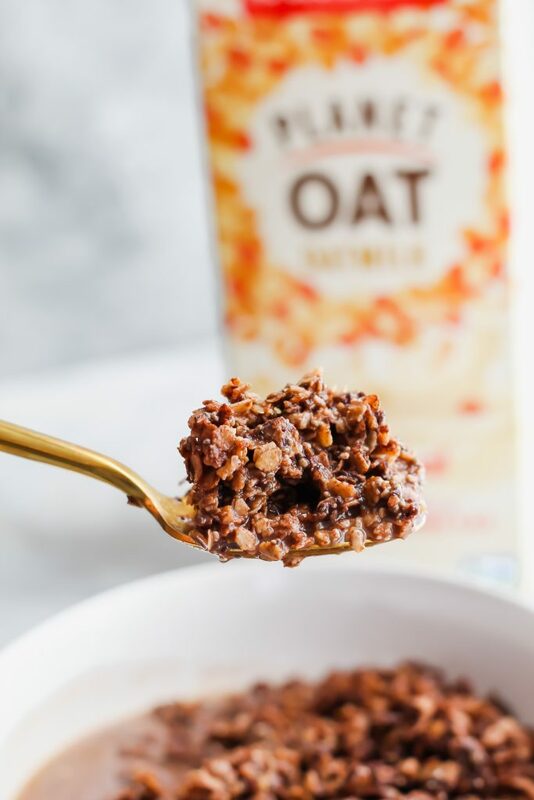 In a large bowl, combine your oats, vanilla extract, turbinado sugar, chia seeds, espresso powder, cocoa powder and espresso powder. Mix together to combine. Add in your melted coconut oil and mix until it's all coated with the oil. Add this mixture in a single layer to a large baking sheet. Bake for 20 minutes, leaving the granola untouched. Once the 20 minutes are done, take it out and add 1/4 cup of the chocolate chips. Mix in to the granola gently. Turn the oven up and bake for an additional 2-4 minutes. Once done, take the baking sheet out of the oven. While it's cooling on the pan, add the other 1/4 cup of chocolate chips on top. Let this mixture cool for about 10 minutes. Eat with cereal, top yogurt bowls or just eat this by the handful as a snack! Store in a tightly sealed jar at room temperature for 1 week. 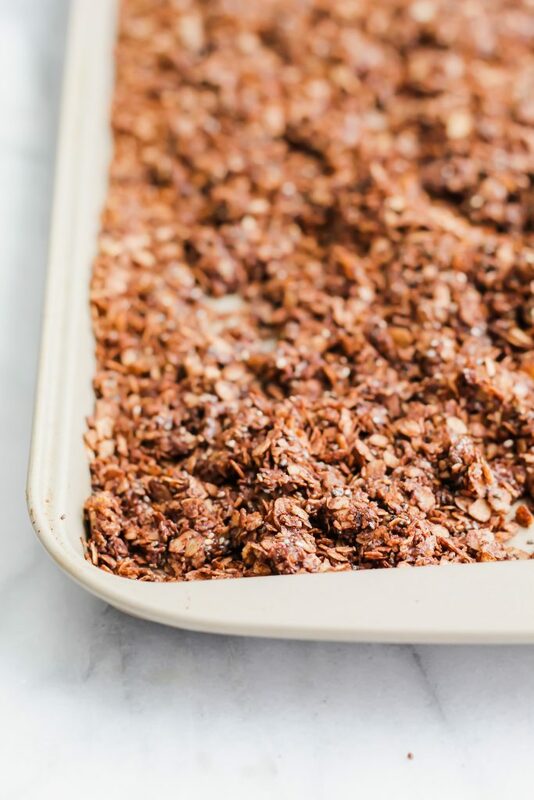 I love homemade granola and usually make a batch every other weekend to get me through the week. I sprinkle it on everything and love it to just snack on. I’ll need to try this coffee version. What a great idea to add espresso powder! I love making it too, Leanne! Such an easy and healthy snack!! The espresso powder not only gives it a coffee kick but also a “rich” flavor – like when you add it to brownies! YUM!